Before Gilbert, Gosnold, and Smith set out for the New World, several hundred Puritans had already left England for Holland in search of religious freedom. Their stay in Leyden was not a happy one, since they found the morals of the local people to be less than strict; so a number of these Puritan pilgrims returned to England and, in late summer of 1620, set sail in the Mayflower for the New World. They arrived at what is now Provincetown on the tip of Cape Cod in November, and paused there long enough to draft and sign the Mayflower Compact, which would be their governing law. But Cape Cod's sandy terrain and scrubby vegetation, which delight present-day vacationers, were too poor for the Pilgrims' purposes, and the search for more fertile land finally brought them to Plymouth Rock, south of Massachusetts Bay, in the middle of the frigid month of December 1620. Half of the Pilgrims died that winter of disease and privation. But luck was with the rest: Squanto, George Weymouth's prisoner, found them and persuaded Massasoit, sachem (chief) of the Wampanoags, to agree to 50 years of peace between his people and the colonists. In 1621 more colonists arrived, and in a few years Plymouth was a sturdy colony. At first, land was held and worked in common, but this system was abandoned when it was realized that family plots would be worked more diligently. Land north and south of Plymouth proved to be more fertile, and soon there were several thriving communities nearby ready to welcome new settlers. The Founders, as they are called, were followed in 1628 by another group of Pilgrims who established the colony of Massachusetts Bay. By 1637 the colony had several thousand inhabitants, and new towns were being founded up and down the coast, and even inland at Concord, Dedham, and Watertown. The Puritan settlers must have seen a bright future, for in 1636 they set up Harvard College to educate young men for the ministry. 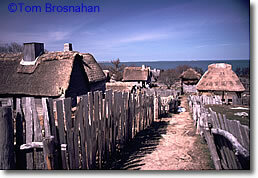 By 1640 there were sturdy communities of settlers in Connecticut and Rhode Island as well as in Massachusetts. By 1680 the indigenous peoples who had lived here before the coming of the settlers were reduced to only a few thousand souls through fierce warfare, European-introduced disease, and alcohol addiction. might have looked in 1636.